A survey confirms the importance of face-to-face discussions, but doing it right requires clear objectives, open dialogue and giving employees specific feedback on how to succeed. In-person meetings are essential to doing business—but how do you get the most out of them? To learn more about optimizing one-on-ones, Soapbox polled 1,000 managers and employees across North America. 1. 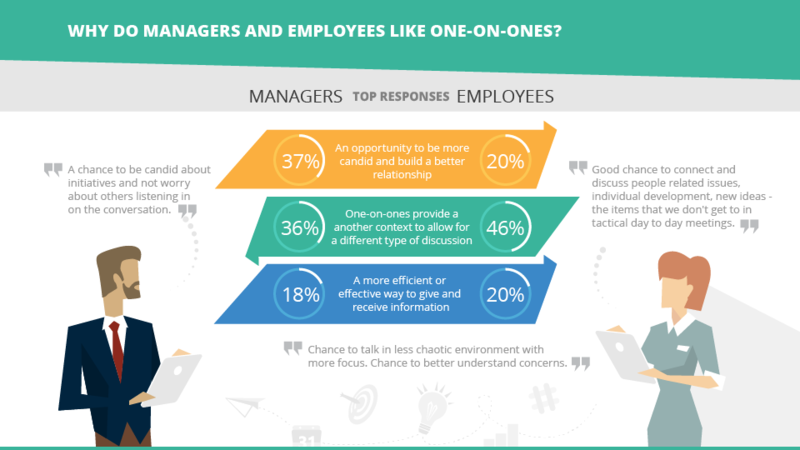 Managers and employees agree that one-on-ones are important. Although one-on-ones are common practice in many organizations, people’s expectations and feelings about their efficacy vary considerably. 2. 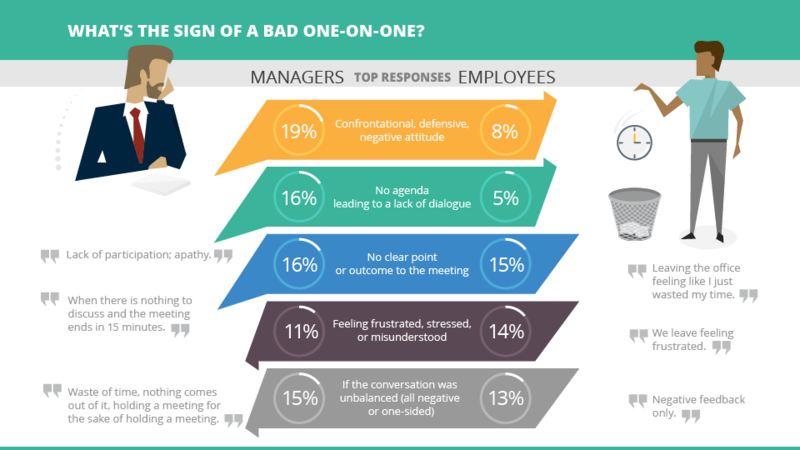 Managers and employees disagree on how well meetings are conducted. 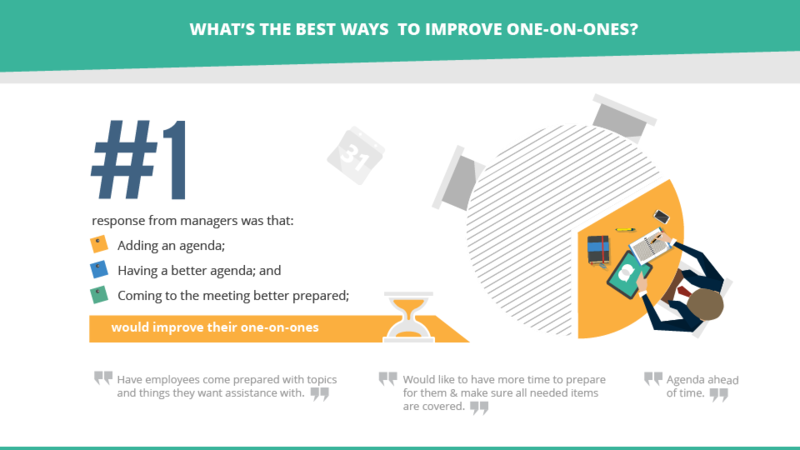 The survey found that managers were far more bullish about the benefits that one-on-ones were having on their team. 3. What makes a one-on-one either motivating or demotivating? Half of the responding employees felt that the most motivating part of a one-on-one was getting the help they needed to be successful in their role. 4. What’s a good sign you’ve had a productive one-on-one? Most managers said the best indicator is two-way communication. Employees focused more on candor and feeling comfortable being open, direct and honest—without fear of being evaluated or judged. Respondents across the board agreed that it’s a waste of time if meetings lack a clear purpose or specific outcomes. 5. What are the most common likes and dislikes? Employees liked speaking with their manager in a way that wasn’t possible during normal day-to-day interactions. 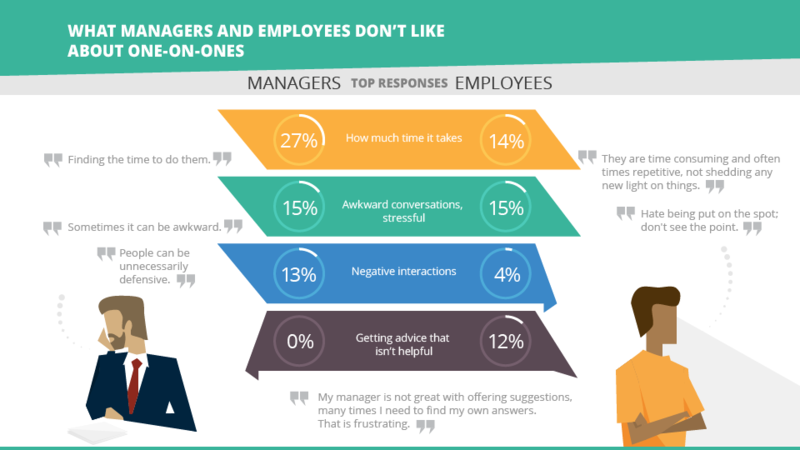 As for dislikes, many employees complained that advice offered in meetings was not helpful. For managers, the biggest downside was the drain on their time. 6. What’s the best way to improve one-on-ones? The survey revealed that most one-on-ones had no agenda offered prior to the meeting. Adding an agenda was the top response about enhancing face-to-face discussions, as it would help the two parties save time and stay on track. Prioritize individual meetings. Regardless of your own feelings, some on your team will find personalized check-ins important. Make those interactions a motivating experience. Agree beforehand about what’s going to be discussed. Doing so helps both parties to have a meaningful, efficient, productive conversation. Create the right environment. Find a place that minimizes distractions. Choose a time when you won’t be stressed by deadlines or other meetings. Block off time in advance to compose yourself and get into the right mental and emotional state. Clearly document key points, outcomes and action items. Avoid covering the same things repeatedly. Make each one-on-one a continuation of the one before. Don’t leave all the communication to the meeting itself. A lot can be covered through other forms of communication. However, keep it all centralized. Keeping track of information and action items helps you measure progress. Bryan Rusche is the director of marketing at SoapBox. A version of this post first appeared on Business 2 Community.